Two drug smugglers died in a car crash after drug dealers replaced the air bags with packages of cocaine to hide it, Mexico police said. 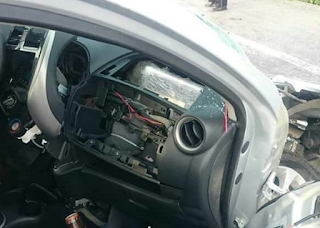 The Tamaulipas police said that the passenger side air bag was used to smuggle 55 pounds of cocaine. The air bag of the driver's seat which was filled with the coco, did deploy. 23 packages of drugs were recovered from the car after it crashed. The paramedics who arrived at the scene, took the two occupants of the car to a hospital, where they died from their wounds and probably the drug. According to the police report, the vehicle was traveling at an excessive speed on the Ciudad Victoria-Matamoros road. The driver lost control and the vehicle overturned, injuring himself and the passenger but also inhaling in more coco that they could take.